Jonas Burgert, Suchtpuls (Addicted to Pulse), 2011, oil on canvas, 13' 1 1/2“ x 22' 7 5/8”. Jonas Burgert’s paintings and sculptures in “Gift gegen Zeit” (Poison Against Time) draw the viewer into a world in which everyone has lost their sense of “narrative gravity”—to borrow philosopher Daniel Dennett’s phrase for the mechanism through which one’s conception of self is produced. The environment Burgert’s gaunt beings inhabit, and which helps to orient their lives, is in ruins. But more than that is gone. They have lost themselves; these blank-faced creatures are just going through the motions of their everyday lives, automatons in a world free of teleology. 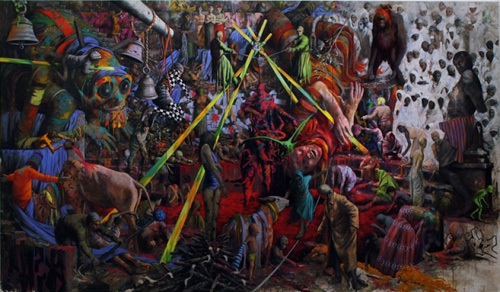 Suchtpuls (Addicted to Pulse), 2011, depicts a jumble of religious and ritualistic activity; hollow-eyed people in ghostly white occupy the painting’s right-hand corner, gazing expectantly toward the work’s center, where a bundle of pigs and people is being either lowered into or raised out of a grafitti-red liquid, in which others languorously bathe. Are they being sacrificed or cleansed? The painting contains so many stories it had to be big—it’s over ten feet tall and wide. At the other end of the gallery, which formerly contained a newspaper’s printing presses, Luft nach Schlag (Air after Hit), 2012, portrays a lone man standing in what looks to be the same apocalyptic urban setting, but with the chaos and liquid gone. Was he at the center of humanity’s downfall? His empty face offers only an ambiguous answer. Each of the other eighteen paintings contains more zombielike creatures making their way through a storyless world. Three bronze sculptures, two of which dwarf the size of any human viewer, further develop Burgert’s dystopia by portraying three-dimensional inhabitants of that realm. Burgert’s works tell the tale of a fascinating, grotesquely beautiful world, and seeing his creatures lost in their memoryless lives we are reminded that it is stories which, strung together, make up our ongoing personal narratives.